I hope you all had a splendid Canada day! I was celebrating up in northern Alberta with a few lovely old friends of mine-22+ years and counting to be specific! We saw one of the best fire works displays I’ve ever seen in my life and had lots of fun swimming and adventuring. I flew home yesterday and hopped on another flight this morning to head back out east for a couple of weeks with my family and friends. As I type this I’m sitting in the Toronto airport eating a build-your-own salad and some salmon sushi, my go-to when traveling. And since this is my 11th flight since Christmas, I’m getting rather used to eating healthy on the go. A lot of airports actually have some fabulous fresh food markets where you can feel relatively good, if not fab, about what you’re putting in your body. I’ve even found kale chips and fermented soda at Pearson international and Minneapolis St. Paul (my very favourite airport in the whole world) has a gigantic market-style store to pick up all manner of health-promoting yummies. One thing I’m missing though is a delicious healthy salad dressing since the ones on offer here are still chock full of icky vegetable oils, sugars, and all manner of grossness. I think I may have to invest in some tiny glass jars to bring in my purse when I travel. Yes, I will become one of those people and I’m OK with that. Thus today’s blog post was inspired by my desire for a delicious dressing. I made this concoction up a few weeks ago when a friend was over for dinner and we were creating an epic salad, but I had no dressings in the fridge. So I looked around and went “yeah this apple needs to go” and the rest is history. It’s got a lovely tangy, sweet taste that pairs well with pretty much any type of salad , plus it’s jam packed with nutrient goodness. Apple cider vinegar has been shown in studies to help balance blood sugar and it’s a great source of probiotics to help with digestion and immunity. Just make sure you buy raw or unpasteurized or all those beneficial bugs will be killed off before making it to your tummy. Apples are a great source of fiber to help feed those helpful probiotics and they contain quercetin, a natural anti-histamine, so they can be helpful for those with season allergies. Honey, again making sure it is raw or unpasteurized, contains some great enzymes that have anti-bacterial and anti-viral effects. It’s a great natural sweetener to use in place of regular sugar and it can even be used topically as a natural facemask. Combining these super foods into one delicious dressing packs a one-two punch of deliciousness and nutritiousness you won’t be able to get enough of! 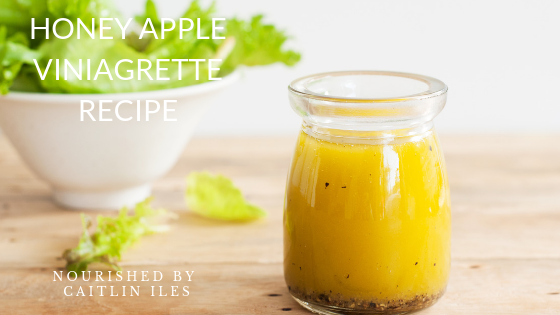 This recipe is packed with the perfect combination of sweet and sour thanks to apples, honey, and apple cider vinegar! Add apple cider vinegar, apple cubes, garlic, mustard, and honey to a food processor and blend until smooth. Slowly pour in oil of choice while blending until emulsified. Well friend, that’s all for today! I hope you enjoy the recipe!